Is there anyone who doesn’t like a clean shower? 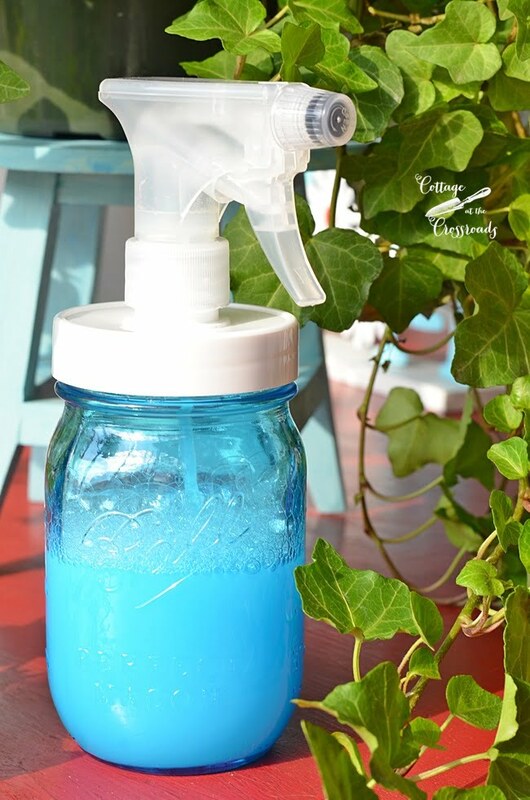 Today I’m sharing a very popular DIY Shower Cleaner but I’ve put it in a very pretty Mason Jar. You can’t beat the combo of clean and pretty, can you? How about clean, pretty, non-toxic, inexpensive, and effective??? Whew! I think I’m hitting all the bases with this one! You’ve probably seen this recipe for a DIY shower cleaner which uses only 2 ingredients-white vinegar and Dawn dish detergent before, right? It’s been all over Pinterest but I’ll have to say that I’ve never tried it. I’m usually skeptical about how effective all these homemade cleaning products are. But I do add white vinegar and baking soda to a load of clothes that are super dirty and super smelly. And I usually grab my Dawn dish detergent to put on oily stains on clothing before I put it in the wash. So I already knew how helpful vinegar and Dawn dish detergent can be. But it was not until I watched one of those Facebook videos that showed the DIY shower cleaner in a Mason jar did I decided to give this a try. 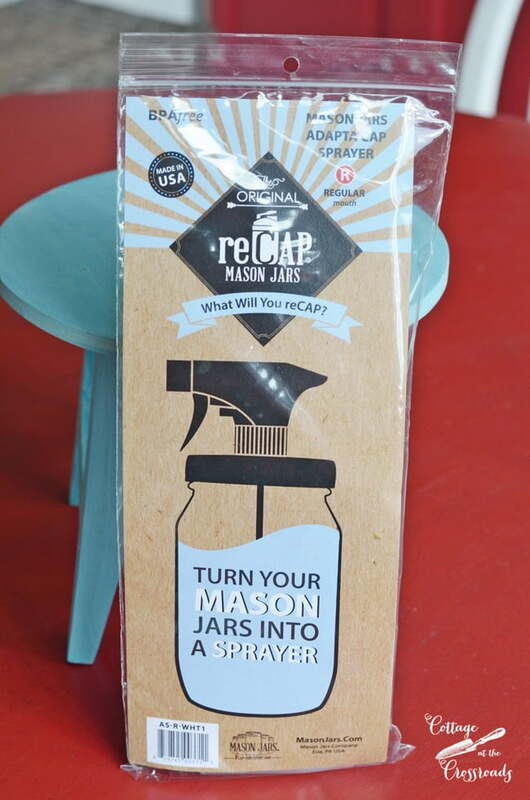 I ordered this (affiliate link) reCap Mason Jar adapter that turns a Mason jar into a sprayer from Amazon as suggested on the video. Now I had seen the pump adapters but never a spray adapter so I had to order one. You’ll see why in just a few seconds. 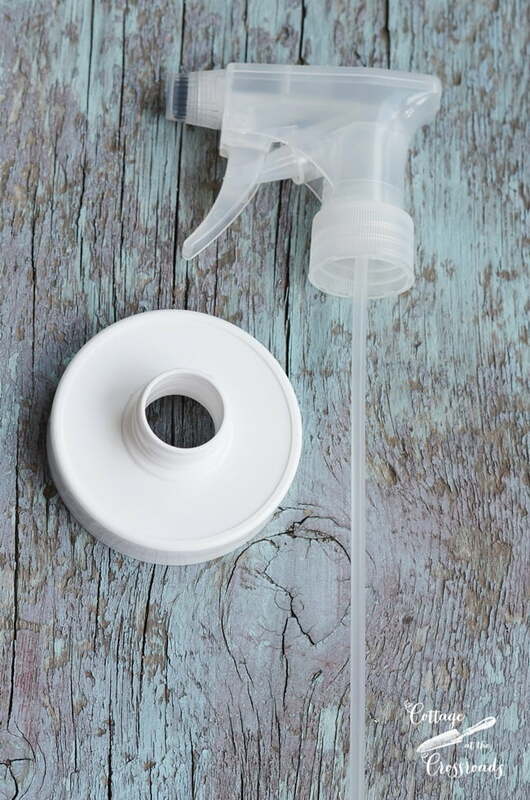 The recipe for making the DIY shower cleaner is simple. First measure out 1/2 cup of white vinegar in a glass container. (I used a pretty blue pint Mason jar.) Put it in the microwave and heat it for one minute. Next add 1/2 cup of blue Dawn dish detergent to the hot vinegar. 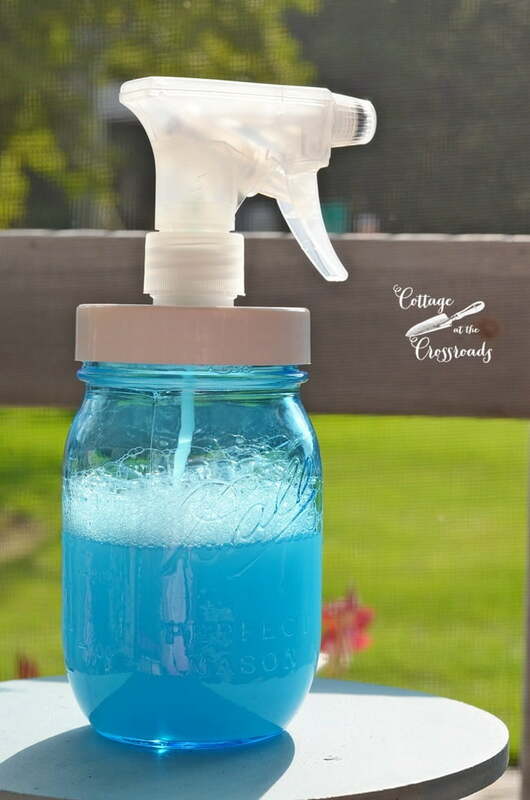 Put the lid with the spray adapter on the Mason jar and shake gently to mix it all together. Why do you need to heat the vinegar? Apparently you need the heat to produce a chemical reaction with the detergent to release enzymes to cut through oil and soap scum. Why do you need to put all this in a glass jar? Because if you use a plastic spray bottle, you are likely to warp the plastic bottle when you stick it in the microwave. The next thing to do is to generously spray the solution in your shower and let it sit for at least an hour. Warning!!! This mixture has a powerful smell! Make sure you have good ventilation in your bathroom when you apply it. The vinegary smell does dissipate fairly quickly. I jumped in the shower and used a scrubby brush on my walls, floor, and one of the glass shower doors. I only did one door because I wanted to compare the results. WOW! This stuff does work, and I will be using it regularly from now on. Note: I used this on a fiberglass shower stall. I’m not sure how safe it is to use vinegar on tile that has not been properly sealed. 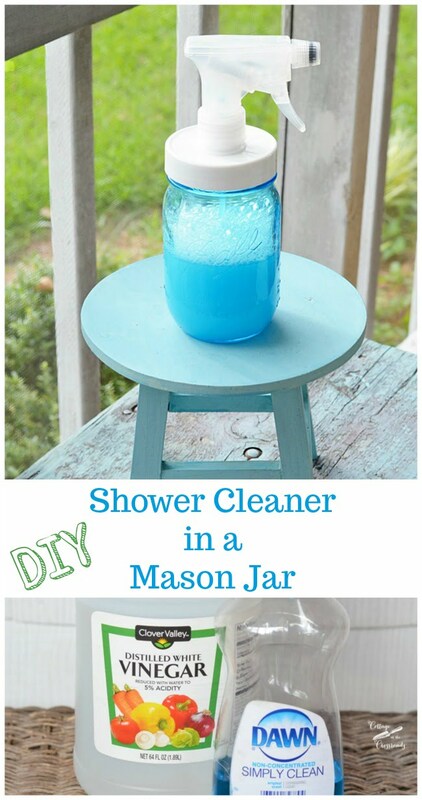 And I can keep it handy in the pretty blue Mason jar in the bathroom! Note: I did learn that you do NOT have to reheat the mixture each time you use it. Only do that when you are making a new batch. 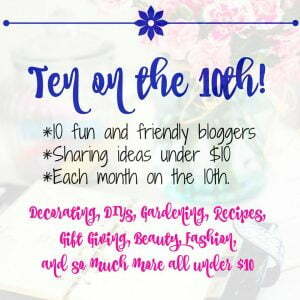 Did you realize that today is the 10th of June? 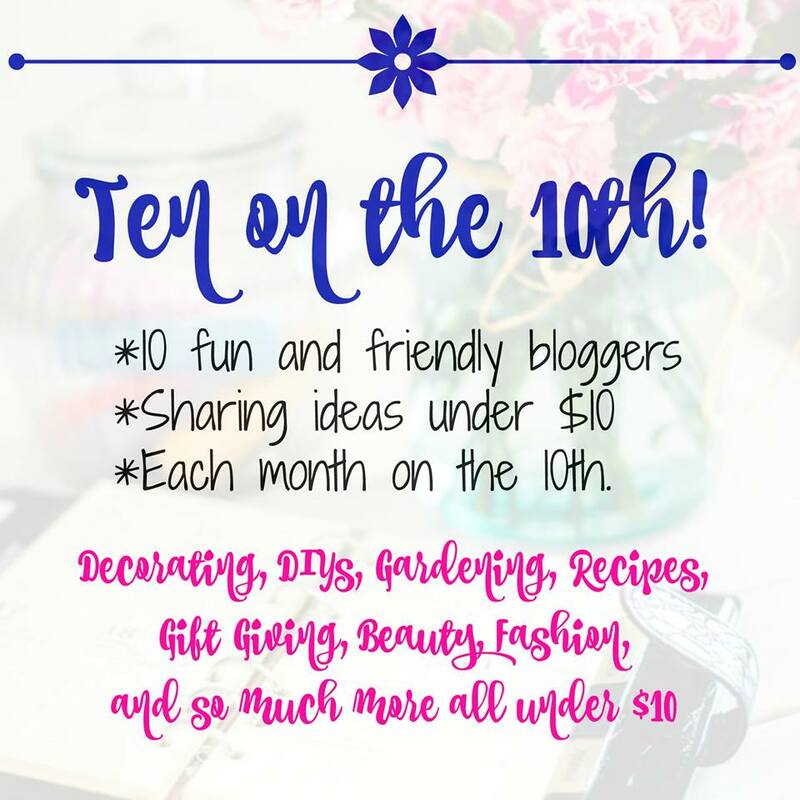 I’m sharing DIY Shower Cleaner as part of our monthly series Ten on the Tenth where 10 bloggers share something that costs $10 or less. I already had the blue Mason jar, the vinegar, and the Dawn dish detergent so I only spent $7.99 on the spray adapter. Let’s see what the other ladies have to share with us today! Click on any of the links below to visit them. This has been my go-to all purpose cleaner for several years now. It is great in the kitchen, too. I’ve read that it kills germs as effectively as bleach. It makes my butcher block island shine up nicely as well. I just keep it on hand and use it on everything. I’ve never heated it, though. LOVE the Mason jar container. Jere, I buy the non concentrated Dawn at the dollar stores. It’s cheaper and I believe it’s the original version. You could try slightly less Dawn when mixing up your cleaner. I use this recipe for cleaning our fiberglass shower enclosure and I love it! I really have not found anything that works better. We have tried this before, and it really does work! I do hate the smell, thank goodness it dissipates quickly. 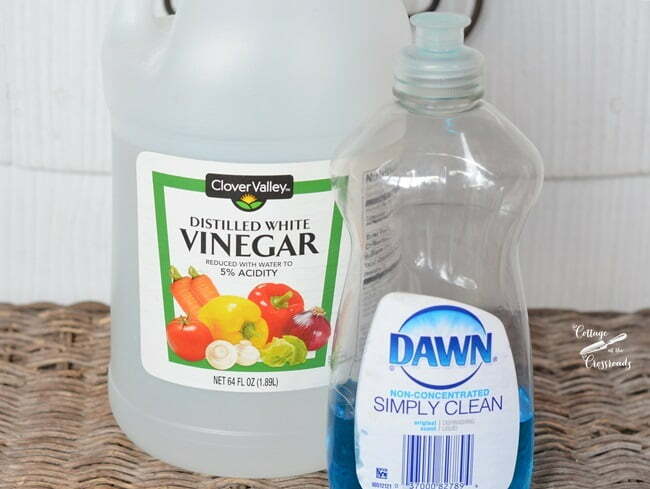 Jane, I’ve not seen this idea, but since I always have white vinegar and Dawn, I’m going to try it. And I’ve never seen the spray adapter so thanks for that information too. I have used this combo Jane and it does work so well. Love the cute Mason Jar to put this in too. Oh my gosh! I just recently tried out the window cleaning version of this recipe. You use the vinegar, Dawn, and water…life changing! It works like a champ. I love using more natural products and saving money. I need to make up a cute mason jar of this shower cleaning recipe. That’s good to know abut the window cleaner version, Lisa! I’m going to make some up and put it in a green Mason jar. Can you tell that I have a lot of Mason jars? This is new to me and such a great idea! I am currently using an expensive shower spray for my shower. I think I need to try this! Thanks for the “recipe”! I’m trying to use more natural products in cleaning, AnnMarie. 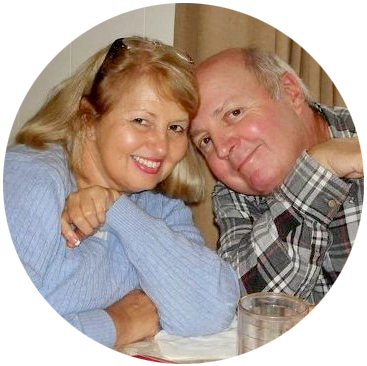 I have avoided using anything in our shower since I had cataract surgery recently. No wonder I saw a big improvement! I’ve seen that recipe on Pinterest too, but wasn’t sure it was worth it to make. 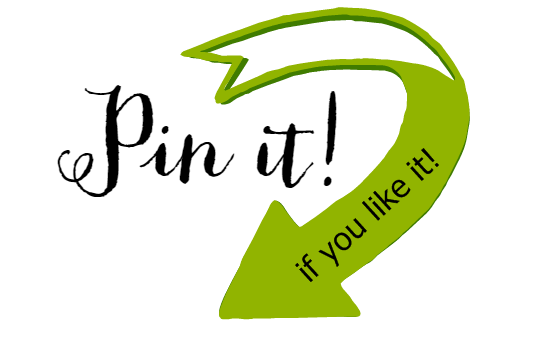 Thanks for the review, I am definitely going to try it! That spray nozzle is the bomb. Isn’t it wonderful? I didn’t even know that the spray nozzle was available! I have used this and it doesn’t work for me. I love the jar though!! Did you heat the vinegar, Susan? I’ve read that it makes a difference.